The Speaker of the Delta State House of Assembly, Rt. Hon. 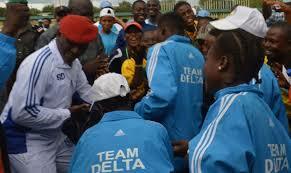 Sheriff Oborevwori, has Congratulated Team Delta for winning the 3rd National Youth Games. He hailed the Team for defending their crown as they were also winners in the previous editions of the competition and bringing honour to the State once again. In a press statement by his Chief Press Secretary (CPS), Dennis Otu, the Speaker stressed the need for youths to continue to indulge in useful endeavors to create a better future for themselves and the State. While saying the Victory of Team Delta at the 3rd National Youth Games was for all Deltans, the Speaker also praised Governor Okowa for investing so much on youth development across all sectors. The Speaker equally congratulated the Chairman of the State Sports Commission, Chief Tony Okowa, for leading Team Delta to victory at the just concluded 3rd National Youth Games in Ilorin, Kwara State Capital. He also commended the Federal Ministry of Sports for organizing such events that provides an avenue to bring the young people together and to improve their development. Rt. Hon. Sheriff Oborevwori assured the youths that the State Government will do more to improve their welfare and charged Team Delta to continue to make the State proud, saying the sky was their limit.